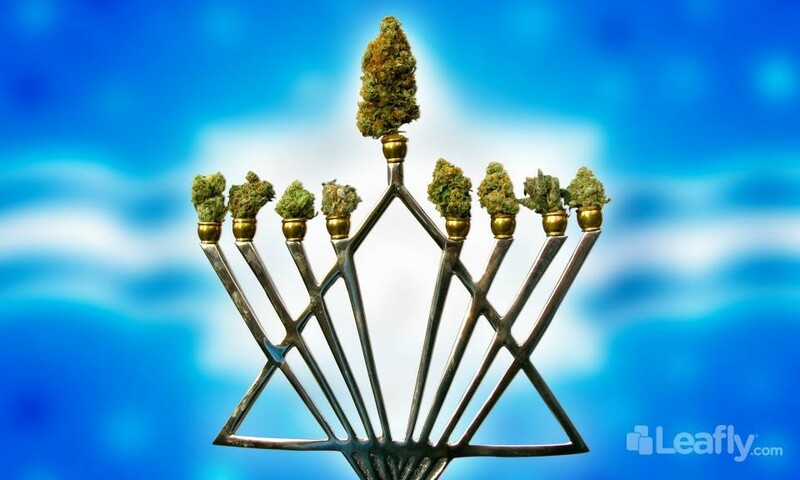 Happy Chanukah, Leafly style! With this much anticipated holiday coming to an end, the Leafly team wanted to make sure your final day was celebrated just right. We hope you enjoy our menorah-de-cannabis as much as we did. Jack Frost: Jack Frost kicks of the first day of Chanukah. This famous sativa-dominant hybrid earns its potent reputation though its genetics: the Frost is a mix between Jack Herer, White Widow, and Northern Lights. This triple threat combination is sure to spark lively conversations at the dinner table. In fact, we thought that this strain was so great, we just had to have it again on day six. Dr. Grinspoon Haze: This Leafly-dubbed “alien finger bud” was a gem found at a local Seattle dispensary. The strain was originally created by Barney’s Farm and is named after the great 1960s cannabis activist, Dr. Lester Grinspoon. While the bud pays homage to a great medical mind and cannabis supporter, it’s also one unique plant. A completely pure sativa, the Grinspoon bud takes cannabis back to the good old days with its ancient linage, making this strain a great way to pay respect to the ancestors of yesteryear. Green Cush: Apparently, this Chanukah is all about the sativas. The uber-popular Green Cush was what the Leafly family had the next two nights. In case you were getting tired of the latkes already, this funky strain has a sweet, tropical flavor, giving you a refreshing break from all of the potatoes and chicken dishes you might have been eating. Trainwreck: Oh, the shamash. The Leafly team decided that this freight-train of a strain is the right replacement for the “helper” candle. Its powerful head-heavy sativa effects make listening to Aunt Susan complain about recent divorce and answering embarrassing questions about your own non-existent love life just a little easier. Super Silver Haze: It’s day five, and Super Silver Haze is here to get you out of that post-wine funk. No one wants to fall asleep before dessert, and this aromatic sativa is just right perk-up. This super energetic strain means that you’re free to skip that after dinner cup of coffee and head right into a much-needed fun night out on the town. Jack Haze: A relative of Super Silver Haze, this giggly hybrid will make opening up that seventh gift all the more entertaining, even if your not-so-fashion-forward mother gave you yet another pair of striped toe-socks and some earmuffs. Cinex: Cinex is our final Chanukah strain. Popular in the gray and dreary Pacific Northwest, this hybrid is a happy cross between Cinderella 99 and Vortex. Prepare to have a smile permanently affixed to your face and look out for the random giggle fits. It's a truly perfect end to a much anticipated holiday.